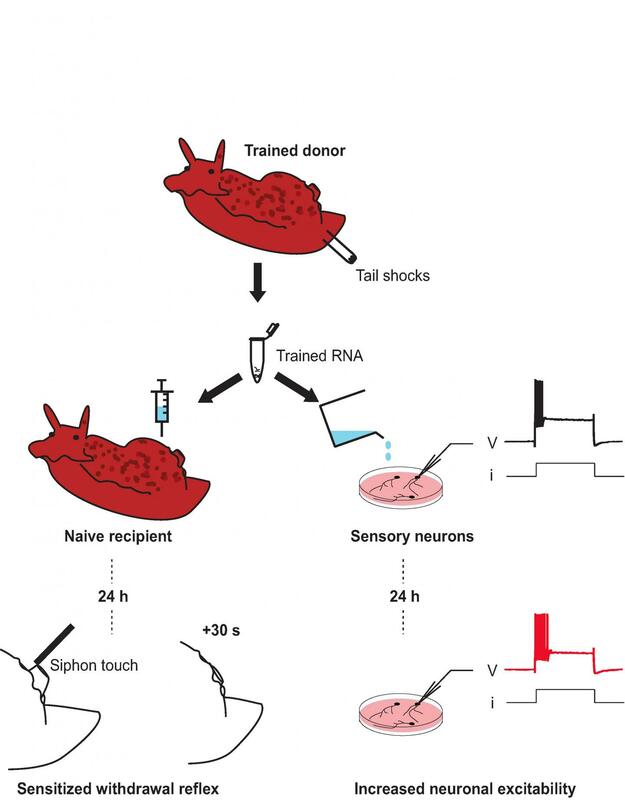 Memories can be transferred between organisms by extracting ribonucleic acid (RNA) from a trained animal and injecting it into an untrained animal, as demonstrated in a study of sea snails published in eNeuro. The research provides new clues in the search for the physical basis of memory. Long-term memory is thought to be housed within modified connections between brain cells. Recent evidence, however, suggests an alternative explanation: Memory storage may involve changes in gene expression induced by non-coding RNAs. David Glanzman tested the possibility that RNA from a trained California sea hare (Aplysia californica) can be used to create an engram — the elusive substrate of memory — in an untrained animal of the same species. The researchers sensitized some snails with tail stimulation that triggers an involuntary defensive reflex. Extracting RNA from these trained animals and injecting it into untrained animals resulted in a similar sensitized response. The trained RNA also increased the excitability of cultured sensory neurons, obtained from untrained animals, which control this reflex. These findings raise the possibility that RNA could be used to modify memory.